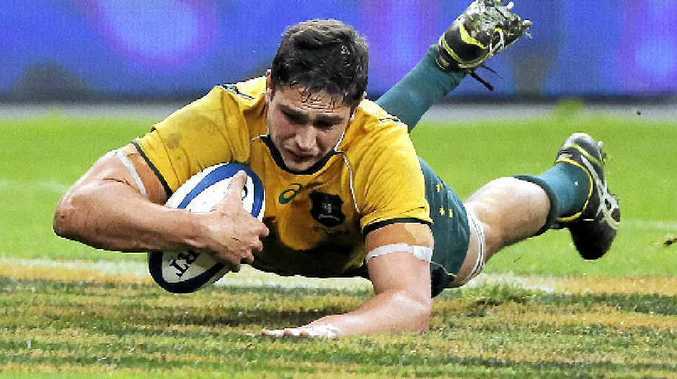 WALLABIES lock Rob Simmons is set to play his milestone 50th Test in tomorrow night's Cook Cup against England at Twickenham after being named in a 23-man team for the last match of the Australian tour. 50-game milestone in 2014, joining James Slipper, Sekope Kepu, Tatafu Polota-Nau, James Horwill and Wycliff Palu. The Queenslander's selection was part of three changes to the team that lost to Ireland at Aviva Stadium last weekend. The third change will see Sean McMahon return to the starting XV at blindside flanker. Australia will be desperate to win against the Old Foe and avoid its worst Spring Tour since 2005. Wallabies starting XV v England: James Slipper, Saia Fainga'a, Sekope Kepu, Sam Carter, Rob Simmons, Sean McMahon, Michael Hooper (capt), Ben McCalman, Nick Phipps, Bernard Foley, Rob Horne, Matt Toomua, Adam Ashley-Cooper, Henry Speight, Israel Folau. Reserves: TBC.